What better mission could there be? Does anything matter more than Love? You've answered your own question, Kim. 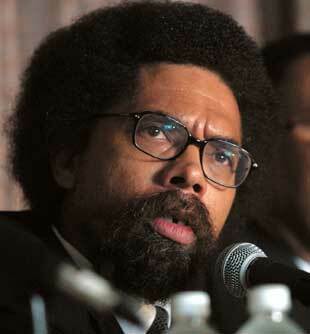 I heard Cornel West (one "L" - don't ask me why) speak one time. He was interesting - and provocative. "I hope and pray I say something tonight that thoroughly unsettles you," were his opening words. I'm the first to admit that his style isn't for everyone, and sometimes that includes me. He can be a tad much with all the fusion of hip hop and higher learning, and I rather liked how then-Harvard prez Larry Summers challenged him to cut the bull with all his pop cultural sidelights (like making rap albums) and focus on more traditional intellectual pursuits, even if it wasn't handled with great aplomb by the famously abrupt Summers. But part of his approach does resonate with me, as it clearly does with others. And by the way, Mike, thanks for the correction on the spelling. I love how eagle-eyed my readers are. Whenever I post something with such an error, I generally hear about it from a reader, often within hours. Thanks. West is like Henry Louis Gates, Jr., and one or two other African-American scholars of their generation: essential to know what they're thinking about, even if you don't always agree with them. I've read I think three (?) of Gates' books at this point, and learned a great deal from all of the them. I enjoy reading West's essays and speeches, when I get the chance, for the same reason; I don't always buy his arguments, but he sure makes you think about things for yourself, reason them through and decide for yourself. I can't give higher praise to a living philosopher than that. Art, you've nicely fleshed out my thinking about West, though with Gates I think he's begun to get so pop (was it the digging up Oprah's roots that did it?) that I've lost some interest in him. Can't say I've read any of either of their books. But I do find West's interviews on his friend Tavis Smiley's show ("Brother Tavis" also published his new book, by the way) captivating. I was recently introduced to West when seeing the film, Examined that played at the Cinematheque here in Cleveland. Yes, provocative is the best word to describe his style, but also, I felt a real sense of warmth about him too - a loving warmth. Don't quote me, but there's a rumor floating about that Mr. West is coming to Cleveland to speak. If I learn more, I'll share - or maybe one of your many inspired readers already has the inside track. How good to see your name here again, Neve. I've never heard of that film (has anyone else seen it also?). And his warmth does indeed come through, in that quote I posted, and in much of his back and forth in interviews. I'm not a big fan of being provocative merely to provoke (lord knows there's way too much of that in our culture) but he generally does so in the very best way, for the right reasons. In other words, a man with a plan. And I believe he's spoken in this region a handful of times, including at John Carroll a few years ago. I was lucky enough to catch that, and will never forget how long the line was afterward at the floor microphones, with people waiting to ask him a question. Thanks John. I've been reading, but always commenting. Thanks, Neve. You're a peach. 1985, CSU, bringing Dr. West onto the campus of CSU and making sure that the SGA was fully behind it. That may well have been his first visit to Cleveland, Lou, and it shows how long he's been a prominent guy. I love how much knowledge and institutional memory we have among readers. Thanks for sharing that.